Remember, to be sure to stop by tomorrow for a GIVEAWAY celebrating my 50th post! I'll give all the details tomorrow, but I promise you'll like it. Now that spring is officially here (in the U.S. - I thought I should clarify in respect to my friends "down under") my eye has started to wander outdoors to our back deck (and garden...or lack thereof, but that's another post). I've always dreamed of having a great back patio or deck where I could have friends over, barbeque and chill out on long summer nights. I finally have a great deck, but sadly not much patio furniture. Here are the realtor photos of my deck from before I bought my house (I'm being a little lazy here...sorry). 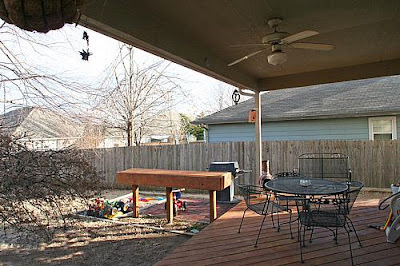 The deck isn't ginormous, but it's definitely roomy and it has lots of potential. The hold up? I need patio furniture. I did score on this little table on clearance at Garden Ridge last fall for $15 (I'm not making that up! ), and I already had the chairs from Ikea (I need to spray them black). 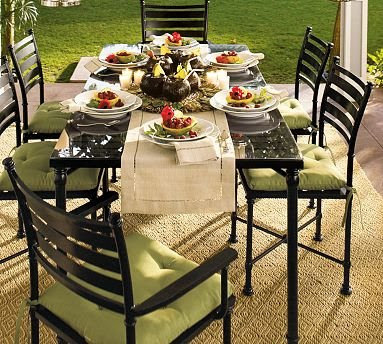 I figure once the chairs are painted black it will have the same feel as this table/chairs from Pottery Barn. Not my dream color combo, but not bad. 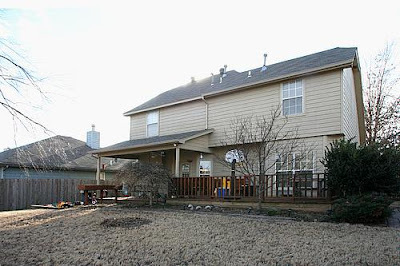 I still need seating for the upper tier of the deck, though, and I really want a loveseat and at least 2 side chairs. I'll be keeping an eye out for bargains to round out my collection of patio furniture, and I'll let you know what I'm able to find. In the meantime here's some great patio eye candy for you. I want a patio! I'm lovin' the pics, but hating my lack of a patio!! 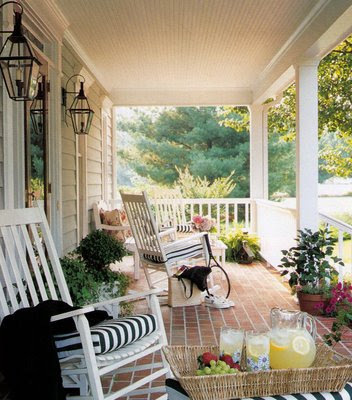 Oh, you should totally put a porch swing on your patio! I love that table you got - what a steal! Those pictures are great! I am sure you will do some magic on your deck. I can't wait to see it!!! We have to spruce up as well. We won't be touching that part of the house until next month sometime, possibly May :(. We have a decent patio set but during this past winter I'm afraid the patio became more of a dumping ground for other things. blah! Like your patio eye candy pictures! Hope you have fun putting it all together. My own patio is suffering from a lack of love and attention, perhaps next summer. All of our outdoor chairs have been stacked, ready for our Winter. It is so nice to get to look at Spring through your eyes. Enjoy pulling yours all out. I want a pretty patio, too! All those pics are lovely! It sounds like a fun project for you! Girl, you've got a great blank canvas to start with! I have the ugliest uneven concrete patio EVER. Thanks for sharing the great pictures, I'm inspired to make some much needed changes! I think your back porch and deck is just awesome! You have alot of great bones there to work with. Your so creative that it will come together and look great! 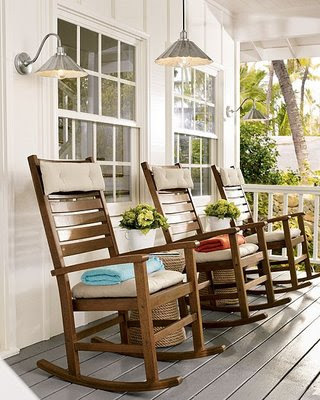 Oh, how I wish my back porch was big enough for something like that lo-o-ong white table with the benches! My dream is that one day we will have a great porch set up so we can eat dinner outdoors every single beautiful evening of the year. I look forward to future posts as this "room" comes into its own! You're porch is going to look awesome! You are already off to a great start. 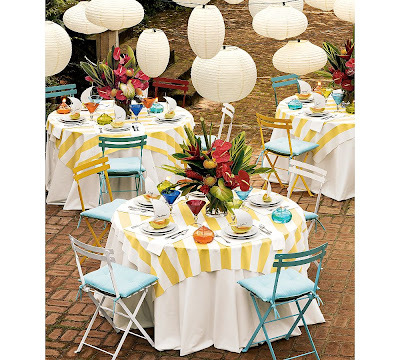 I like the look of painting the Ikea chairs to match the table....tres chic! I love all of your inspiration photos and I know you will do a great job with your patio. What great photos. We're still working on landscaping our backyard and pation furniture can be so expensive!! Yikes! Can't wait to see what you find! 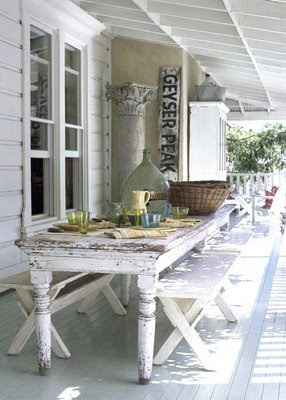 I'm liking the white farm table with benches! I just saw some cute patio furniture at the Salvation Army recently. Also check craigslist, I bet you can find something! Love your inspiration pics and your drawing...I have a notebook full of sketches like that, gotta draw them while they are fresh on my mind! :) Looks like you have a plan, can't wait to see the finished product! Oh yes, I luv all the patio inspirations you posted! I'm also coveting a vintage set from a local vintage shop...but gotta save up for it first as I have tons of other projects lined up. Thanks for visiting me the other day...I really luv your blog! I'm sure that patio will look amazing when you are done with it! I can't wait to see your master bedroom rereredo? Ha Ha...get it? Ha! It IS a rereredo...I do that a lot :). 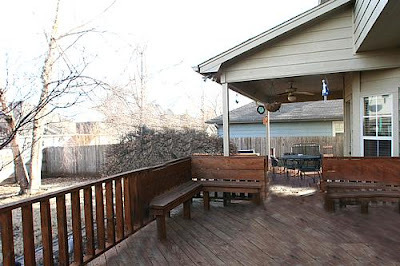 Your deck has a potential to look even better than those sample photos you uploaded, AnNicole! Hey, I found this from Pinterest: http://pinterest.com/pin/163748136424018850/. You may check it out if you want. The deck seems similar to yours. It’s simple but it’s very elegant and welcoming. 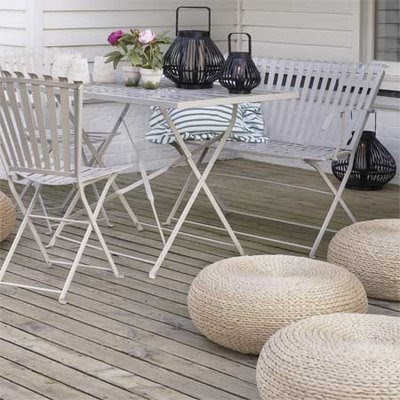 Your guests would love to hang out at your deck if it would look like this. Ikea + 1 Teenage Boy = B.O.R.E.D.